TPO is a type of membrane roofing suitable for flat and low-slope roofs. In the building trades, the acronym TPO stands for thermoplastic polyolefin, a material originally developed for pond liners and used extensively for roofing since 1989. 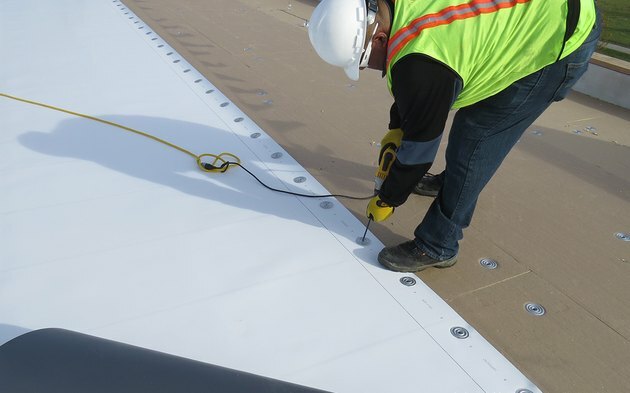 It's a single-ply membrane made from a polymerized combination of polypropylene and ethylene-propylene rubber that can be attached to a roof with adhesive or with mechanical fasteners. TPO a low-cost and effective choice for flat and low-slope roofs, and the exposed surface is usually a highly reflective white, which makes TPO especially suitable for hot, sunny climates. You can install TPO roofing directly over existing roofing material, or you can apply it to a bare roof deck. It compares favorably in expense to similar roofing materials, such as EPDM (ethylene propylene diene monomer) rubber or PVC, and it typically carries a 20-year warranty. If you live in a colder climate, or you're considering it for a low-slope roof which it will be visible from the ground, you don't have to settle for white. 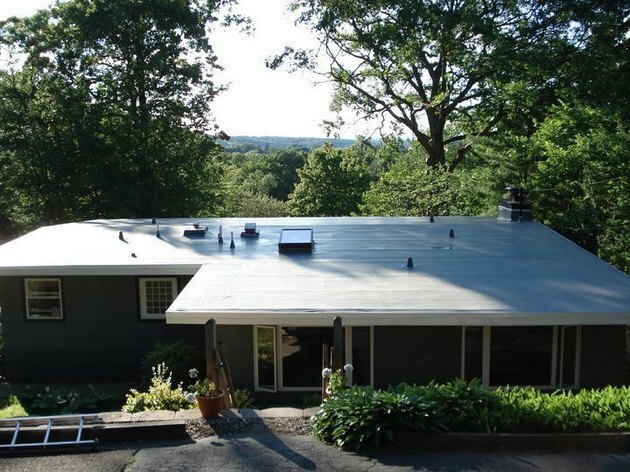 TPO roofing also comes in gray and black, although white is the most common color. TPO roofing comes in 6- to 8-foot sheets that you lay out side-by-side and weld together. 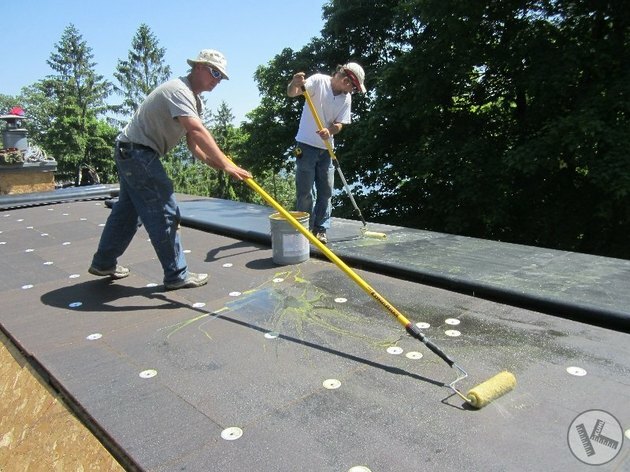 Roofers generally use one of two methods to adhere a TPO membrane to a roof. One is to use mechanical fasteners, which are typically screws accompanied by large plastic washers. The other is to use a solvent- or water-based adhesive to secure the membrane to the existing roofing or the roof deck. In certain circumstances, neither method may be practical, in which case, heavy objects, such as river rock are used to hold down the membrane. A layer of rigid foam insulation often goes on before the TPO membrane. By itself, TPO roofing doesn't provide much insulation, so many installations include a layer of rigid foam insulation, which is secured to the roof with mechanical fasteners or adhesive. 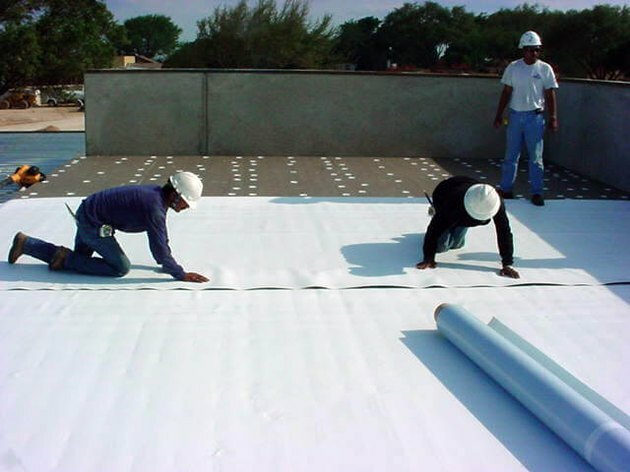 Just before installing the membrane, you typically install a _slipsheet_—a low-friction barrier that allows the roofing to expand and contract freely. 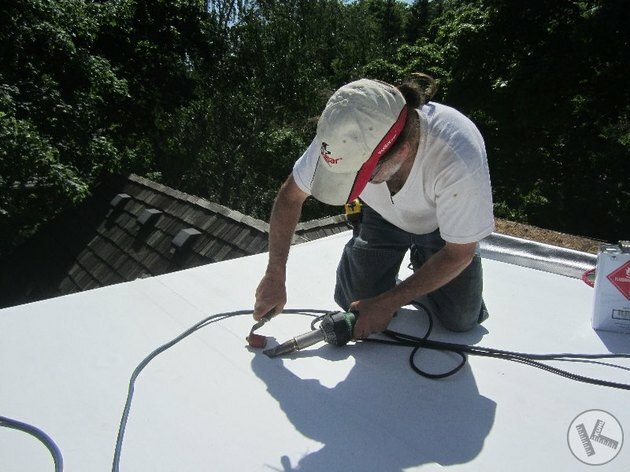 The seams of TPO roofing are closed with a heat gun or with peel-and-stick tape. 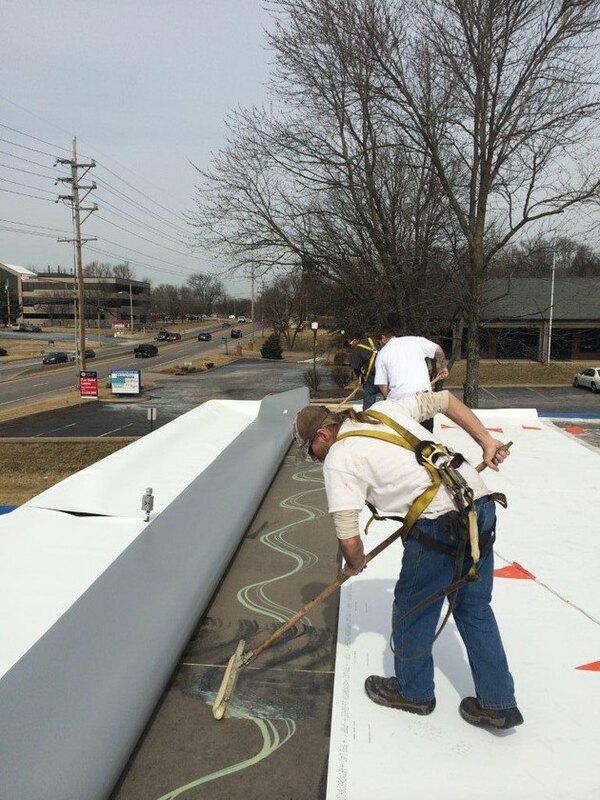 No matter which installation method they use, roofers roll out the TPO membrane in overlapping strips and seal the overlaps. Seam and edge sealing is the most sensitive part of the installation process and makes the difference between a roof that leaks and one that doesn't. The traditional method for seam welding is to use heat. Commercial roofers use a heavy-duty automatic heat welder for large buildings, but a hand-held welder is suitable for small projects. In recent years, manufacturers have begun to offer a second option: peel-and-stick tape, which is usually used in conjunction with a primer. Install TPO on a clean, level surface. Clean and prepare the roof, making sure to sweep it clean of all debris, flatten any hump,s and repair any concrete cracks greater than 1/4 inch wide. Install rigid foam insulation, if necessary, by attaching it to the roof with mechanical fasteners or adhesive. Attach a slipsheet with fasteners or adhesive. Attach roof edging and other metal flashing as necessary. Roll out the sheets of roofing, give it about 30 minutes to flatten out, and cut it to length. If attaching the roofing with an adhesive, apply the adhesive to the roof according to the manufacturer's specifications and secure the roofing to it with the recommended overlap. If using mechanical fasteners, drive the fasteners at the recommended intervals. Seal the seams, roof edges and flashing with heat or tape. Seal vents and other common fixtures with specially made TPO boots. A roof drip edge typically goes on top of the TPO membrane after it has been installed. The drip edge prevents moisture damage to the roof deck while holding down the edges of the membrane. Vents, skylights and chimneys usually require an extra layer of TPO flashing, which goes on after the roofing has been attached. This flashing is applied around around vertical corners with special corner attachments, and is then heat-sealed to make it waterproof. Some installer secure the edges of TPO sheets with approved metal fasteners before overlapping the next sheet. TPO roofing has a lot going for it, but roofers are also quick to point out its flaws. Its history as a pool-lining material attests to the impermeability of the material. The rolls are only 8 feet wide at the longest, however, which means that virtually every TPO roof has seams, and the seams can leak. Cost-wise, TPO generally falls between its two main competitors, being more expensive than EPDM and less expensive than PVC. A TPO roof costs between $5.50 and $9.50 per square foot. An asphalt roof costs between $8 and $10 per square foot installed. TPO is durable enough to resist punctures and flexible enough to stretch as the structure settles. It maintains its integrity throughout a wide range of thermal expansion and contraction. White TPO is highly reflective, and quality products are Energy Star rated for energy efficiency. Other light colors are also reflective enough to reduce cooling costs during hot weather. Contributing to its status as a green product, TPO is completely recyclable. Old TPO can be ground up and incorporated into new material. Because it's a lightweight material, TPO is easy and inexpensive to install. It's also easy to clean with a power washer, which helps keep down the cost of maintenance. There is a large variance in quality between products. Less expensive materials can crack, craze and delaminate, and the seam welds can fail, especially when exposed to severe temperature differences. The quality range means you probably won't save much in the long run by choosing a less expensive product. Opt for better, more expensive materials. As of 2019, TPO is still a relatively new product in the market, so its longevity is largely untested. Moreover, manufacturers are still working out bugs in the technology. When a TPO roof does leak, the leak can be hard to find and even harder to repair. Repairs that require removal of part of the roof covering can be expensive. TPO can deteriorate under high thermal and solar loading and may not last as long as expected in hot southern climates.